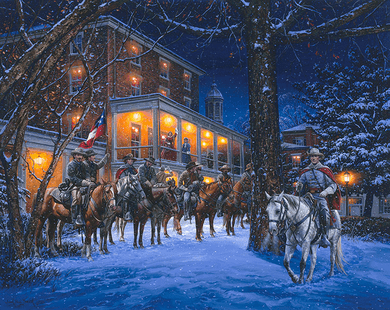 John Paul Strain Hand Signed and Numbered Limited Edition Giclee:"Mosby's Rangers in Warrenton"
Image Size: Paper 19.25 x 24.25/ Canvas: 19" x 24, and 25" x 31.5"
Edition: Signed and Numbered Giclee - edition of 250 on Paper and 170 Canvas editions. About the Art: Warrenton Virginia was Mosby's Rangers country. The Rangers were a partisan unit of local young men that operated in and around Fauquier, Loudoun and Fairfax counties. Using the tactics of unexpected lightning raids, clandestine night operations, and then disappearing into the countryside brought fear and uncertainty to Federal soldiers. Whether real or imagined, no Federal soldier ever felt safe in Northern Virginia. On the snowy evening of January 18th, Mosby and his Rangers stopped in Warrenton for a well deserved dinner at the Warren Green Hotel. Upon leaving he gave instructions to his men to hide among friends in Fauquier county and meet him on January 26 at Mount Zion Baptist Church just east of Aldie for their next adventure. -J.P.S. No thank you, I just want the 19x24 unframed print.